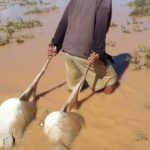 Pictured: Mervyn Muendjo and the sheep that drowned during a freak flood on the resettlement farm we he also raises cattle. 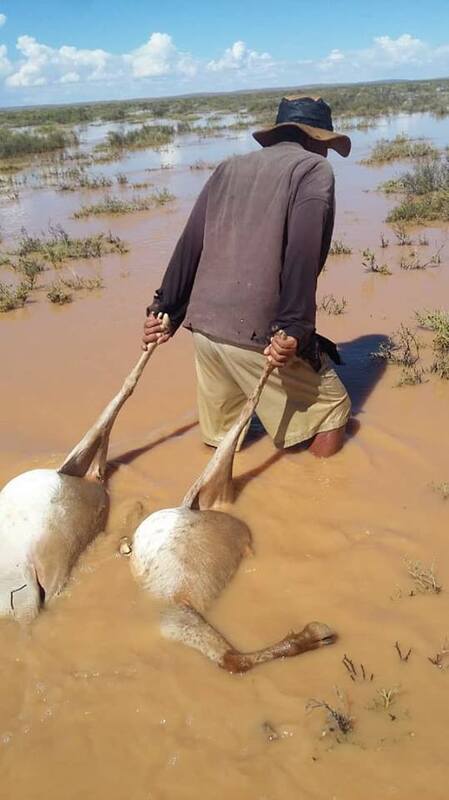 Mervyn Muendjo, a young upcoming farmer who raises sheep and cattle on a resettlement farm between Aroab and Keetmanshoop, suffered severe financial losses when a significant portion of his sheep flock drowned in a freak flood over the past weekend. Muendjo said he has never seen or heard tales of so much water in the area where he grew up in his life. He said some of the sheep must have strayed from the bigger flock and by Sunday morning he and a few of the other people who share the resettlement farm, Klein Aub 42, with him went looking for the lost sheep. He said all they could do was to drag the dead sheep by their hind legs to higher ground where he and the other men butchered the animals for their meat. “Other areas of the farm are still so deep under water that we can’t reach it by foot. I don’t know what happened to my 70 head of cattle. Once the water flows away or dry up we will go look for them and some of the other sheep that are still lost.” Muendjo said on Tuesday. Besides losing more than ten percent of his sheep during the freak flood he said he estimates his financial losses to be about N$25 000. The loss might be even bigger if more of his animals died as a result of the heavy rains of the past weekend. Muendjo said that despite the loss of some of his sheep he will continue farming and that because of the rain and the new grass would grow to feed his surviving animals.